Crash Test Dummy: Rob McWhinnie Product reviewed: Seismic Landslide 83a After driving down from Byron, the first place we had to hit was the Hopshop to check out the new gear and shop fit out. After a quick catch up, Robbo pulled out some new wheels for Maga and set up her new board. Before she got a look at the new ride I had it out on the street and shredding. I was warned of the first slide so took a bit easy, the wheels chosen where the new Landslides from Seismic. They're blue, rescrubbed and centre set, 75mm 83a. The responsiveness and consistent slide blew me away, I don’t know if I’ve been out of the freeride loop or just been riding race wheels for too long, but I was so impressed with the freeride ability of these wheels straight off the shelf. The Landslide is a very similar sized wheel to the purple Durian, that I’ve always been a fan of but these have just a little wider contact patch. Hands down the wheels did seem to drift a little too much but I’m sure its just my technique. After a solid session behind the Hopshop, I started hitting the toe sides hard, feeling free to get it sideways knowing that it was always going to come back with no trouble. The result was my first pendy style standup toeside! Stoked on a new slide in the bag, I got Maga to start taking photos and the ripping continued. After I threw on some Durians for a straight up comparison, the result was shocking, the Durians needed more time to work in and definitely harder to break out and bring back. Buttery, controlled, predicable and new to the market, Seismic’s first free ride wheel has completely impressed me with its "ready to thrash off the shelf" ride. The company that you brought you the fastest longboarder in the world, Mischo Erban, looks like they will be making their mark this year in freeriding. The new range extends to a smaller 70mm version called the Bootleg. The next morning back in the skateshop, we rocked up and were about to start work when Frenchy mentioned a new road close by. Fifteen minutes later Jacko and I were hitting it like the old days and I broke out the Landslides for a solid session. 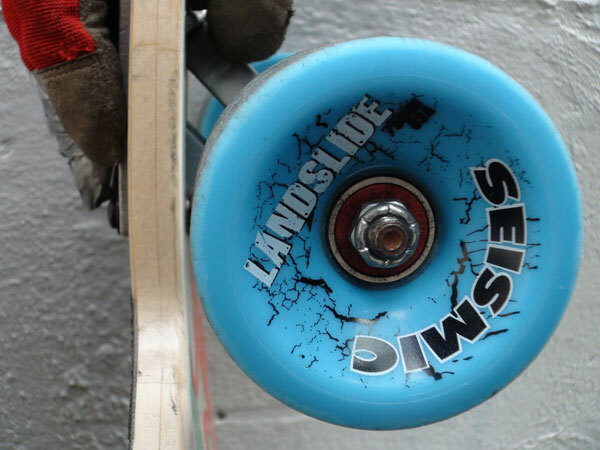 If you got some cash and looking for new a feeling on your freeride board, try these new Seismic freeride wheels and have a thrash. Oh yeah Maga got her board back with half shredded wheels ... after a whole lot of quality control! She was stoked that I was out ripping, so all's good. Peace. ROB Disclaimer: This is genuine review. Seismic did not provide free wheels, or solicit or pay for a review by the Hopkin Racing Team. This is what we do, test and ride anything new that comes into the Hopshop. How else do we know if it is any good?